You all keeping cool for the 4th of July weekend? We ditched city life and the convenient cell phone service & wifi that comes with it to escape with my parents to their woodsy lake cabin for a long relaxing weekend. As nice as it feels to disconnect from the outside world for a few days, we weren’t prepared, and after 36 hours, we find ourselves enjoying an iced tea and the free wifi at the Peninsula Market. 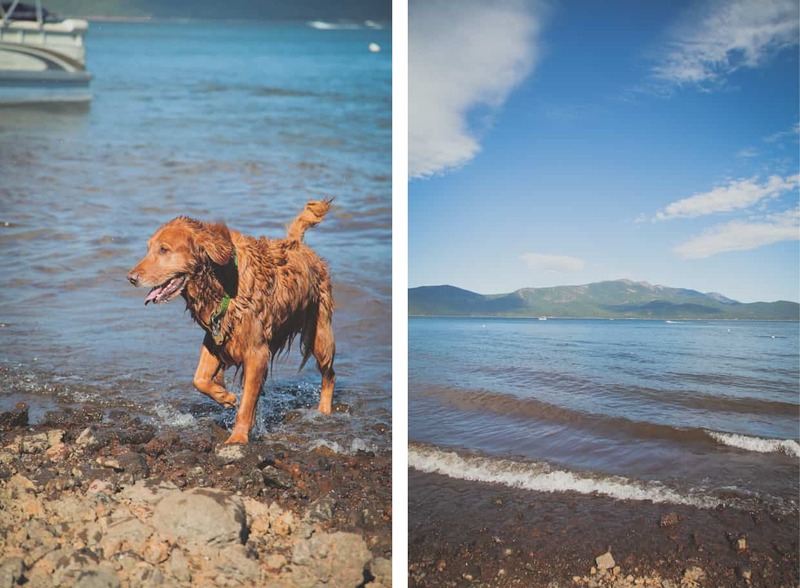 We definitely need more practice in leaving the hustle and bustle of city life behind. You know you’ve got a problem when you run your phone battery down while searching for one burst of service so you can load your Instagram feed. How else will I know what Tina’s doing in Iceland or what The Kitchen McCabe baked for the 4th of July?! I’m trying my hardest to channel my inner country girl who grew up camping, fishing, and throwing muddy tea parties on the beach. That tow-headed blonde girl spent every daylight hour running around on the beach, and wore a dark tan without ever getting a sunburn despite swearing off sunscreen. She spent hours snorkeling stomach-down on an inner tube hunting for lost lures along the beach, gutted her own fish, and almost always had a scrape on her knee. This grown-up city girl got a splotchy sunburn after 4 hours wearing SPF 50 under an umbrella. We spent the afternoon on the beach with the family, taking turns spinning circles on the WaveRunner between constant snack breaks, with a fishing line in the water just in case something bites. Tonight we’ll grill up bass tacos with my aunt, uncle, and my cousin Alex – the one who taught me how to build rock forts in the woods, while I brought along my pink plastic tea set and showed his Ninja Turtle action figures a proper party. What’s the best side dish for a 4th of July grill-out? This vegetable-filled cauliflower macaroni and cheese (and maybe this perfect potluck potato salad). On the back of our wedding RSVP cards, we asked our guests to “share a favorite family recipe.” My gal Lana Shea sent us her recipe for “THE BEST EVER MAC AND CHEESE!! !” that she later made for my bachelorette slumber party with a dozen of my closest girlfriends. 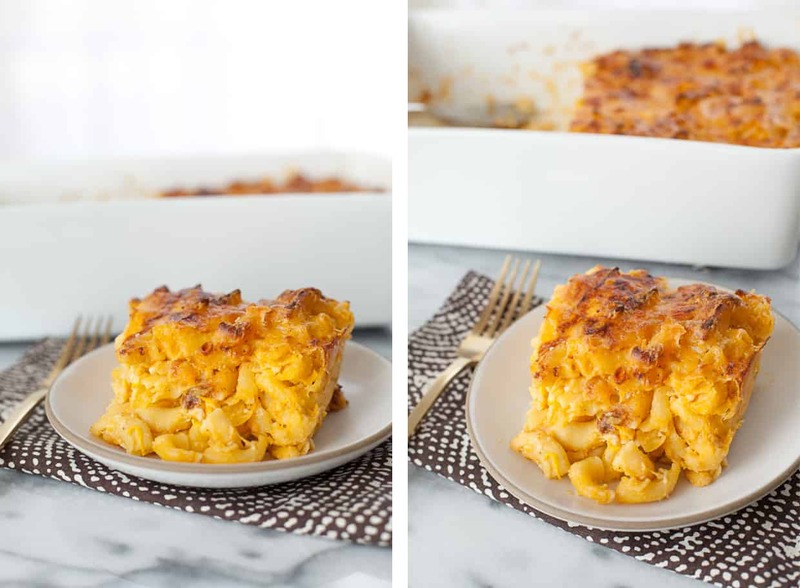 Lana doesn’t lie; this mac and cheese is perfect in every way. I’d say a year later is about the right time to start sharing some of these tried-and-true recipes, right? When our next door neighbors had a baby, I knew just the dish to bring over. Since I’m a sneaky sneaky cook, I hid some shredded squash and cauliflower in the dish to slip some veggies to their 3 year-old daughter. And she was none the wiser. Sharp cheddar mixed with sour cream and cottage cheese give this casserole a hearty texture with bursts of cheese. 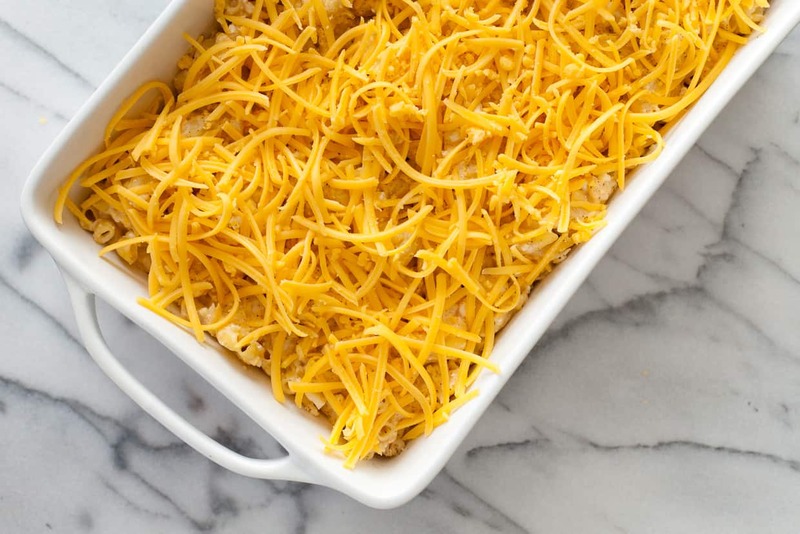 The melted cheese on top add a crispy layer that give every bite substance. 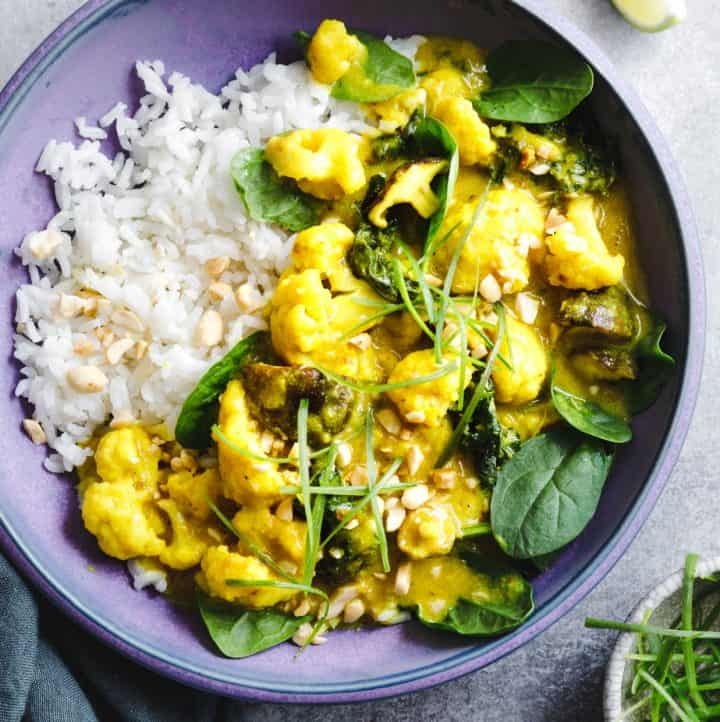 Hiding among the cheese, the yellow squash and cauliflower add only a slightly noticeable flavor boost, while bumping up the nutrition benefits tenfold. Prepare to field several recipe requests every time you make it. 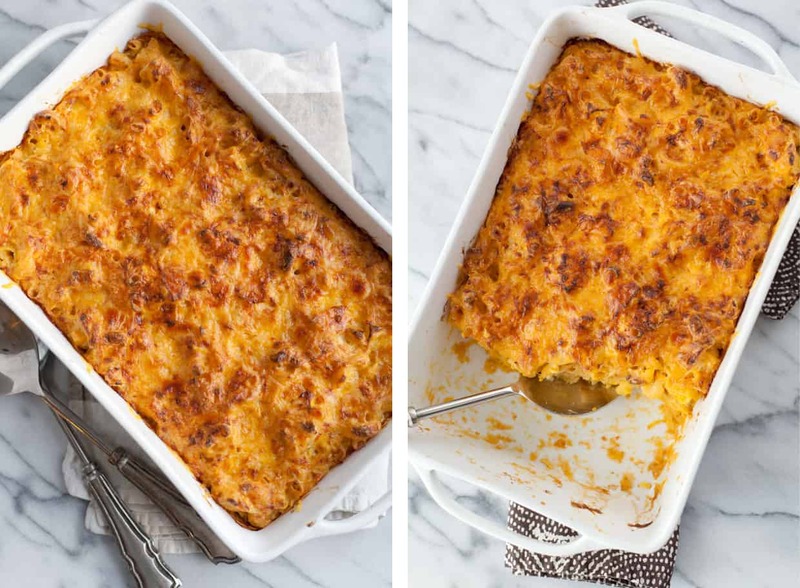 With this baked cauliflower macaroni and cheese, you’ll never need another mac and cheese recipe again. Pinky promise. Cook the macaroni according to the directions, under cooking it just slightly. Gluten-free mac and cheese can over cook REALLY fast, so as soon as it is al-dente, drain it. 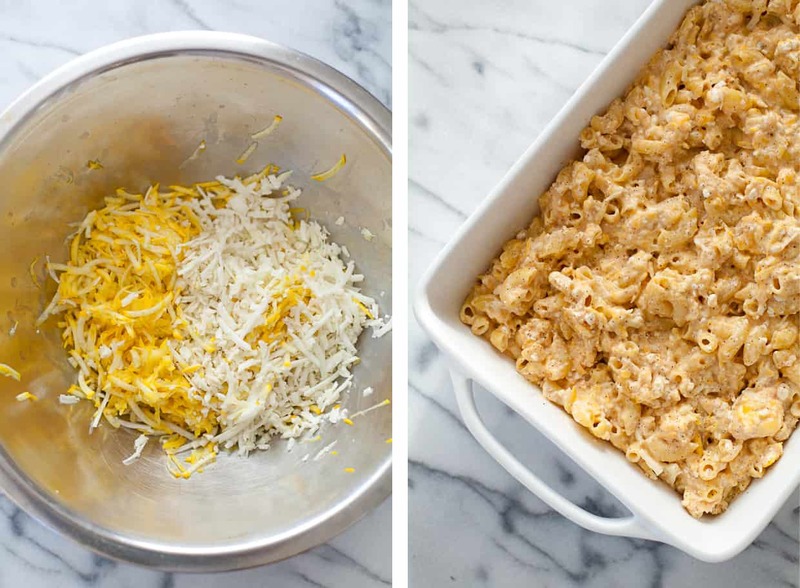 While the macaroni cooks, mix the rest of the ingredients together in a large bowl, reserving 1-1/2 cups of grated cheddar cheese. Drain the macaroni and add it to the large cheese bowl. Mix until well-combined. Pour the macaroni into a 9x12 glass baking dish. Sprinkle the reserved grated cheddar cheese over the top. Bake for 25-30 minutes. Turn on the broiler and broil for 6-9 more minutes until the top turns brown and crispy. Gurl, who knew? Cauliflower! I hope you are having a great holiday weekend! Cauliflower is the newest hidden vegetable. Use it in pizza crust, as “rice” or even in alfredo! Dear cauliflower, we’ll be best friends forever. I really want to make this!!! Sounds delicious!! Oh my god, this looks SO. GOOD. 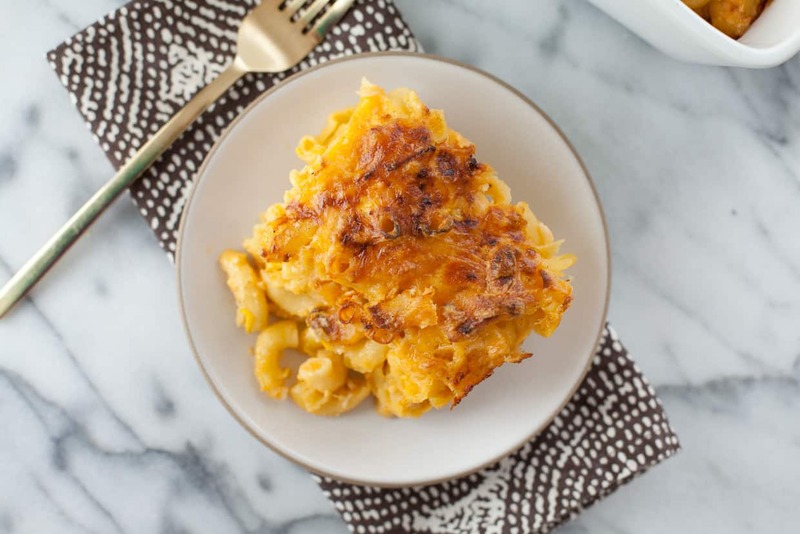 I’m always trying to find a way to justify my mac & cheese cravings and you’ve totally health-ified it a million times better than I ever could. Drooling. Ha! 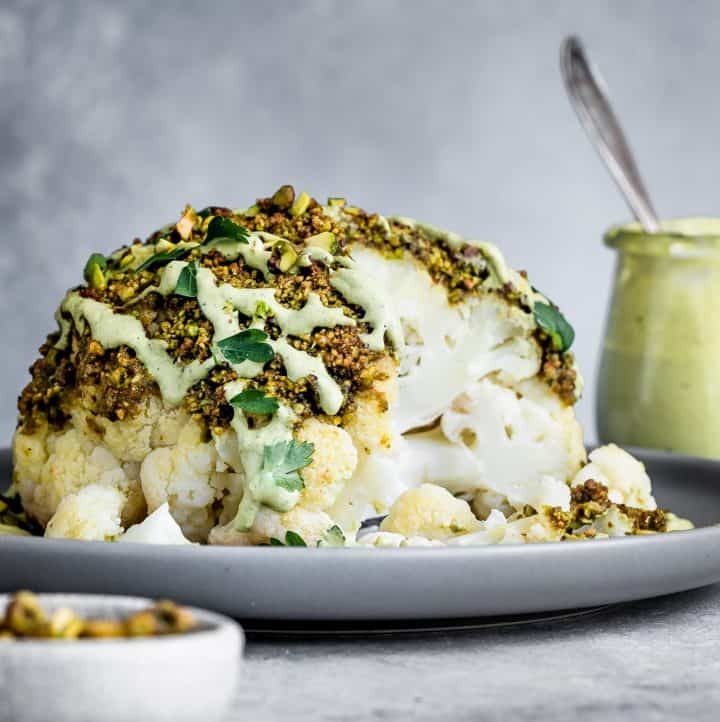 That’s my trick – throw in cauliflower and never feel guilty again;) Thanks for reading! This looks amazing! Do you think greek yogurt could be used in place of the sour cream? Perhaps 2% would work? I’ve never tried that, but it sounds like a really good idea! Since greek yogurt is strained yogurt and won’t separate in baking, I think a full-fat greek yogurt would totally work. Please let me know how it goes! never ever heard of quinoa macaroni before! definitely on the hunt to find some now. 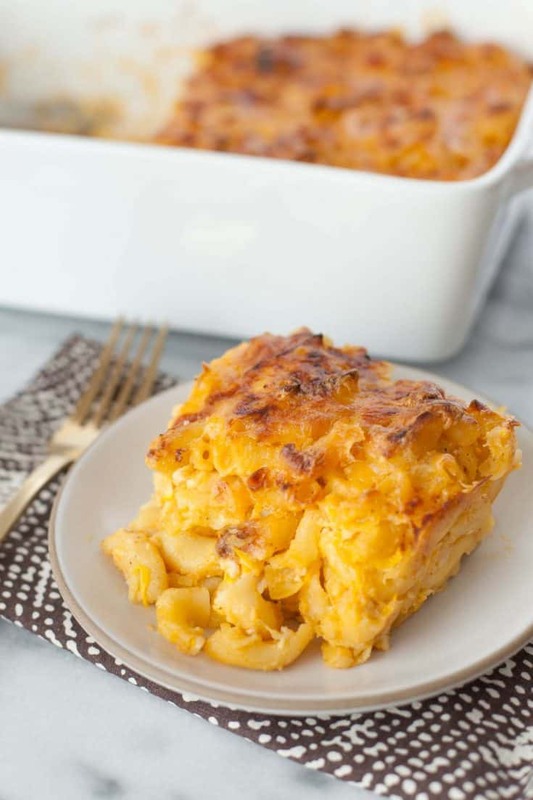 what a great recipe too – i will definitely be recreating the classic mac + cheese after reading this post. thanks! Thanks, Thalia! 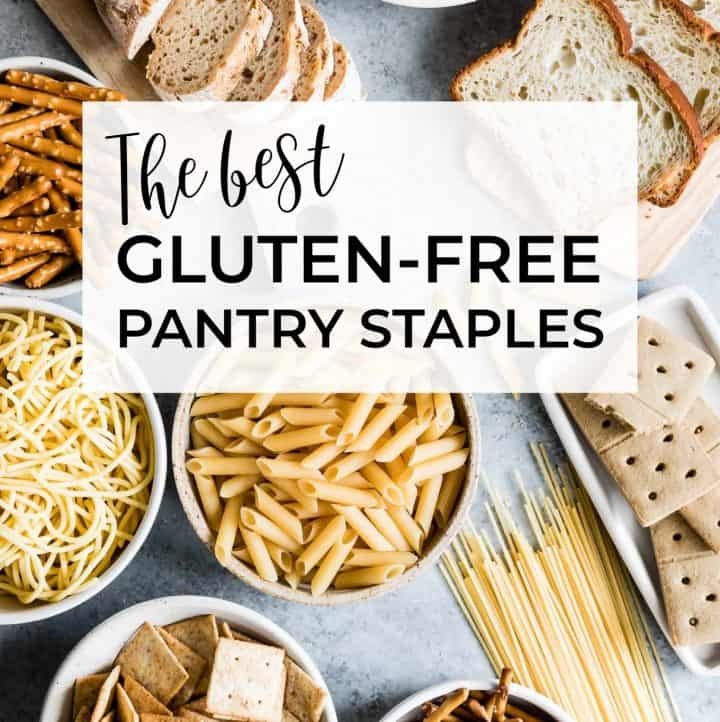 Definitely look for them – the Ancient Harvest brand is the best gluten-free pasta I’ve found…mimics the texture and flavor of regular pastas. Hope you enjoy this mac & cheese as much as we do! Thank you so much Deborah! I hope you like this one! This recipe looks delish but I can’t stand cottage cheese taste and texture. What else could I substitute in its place? 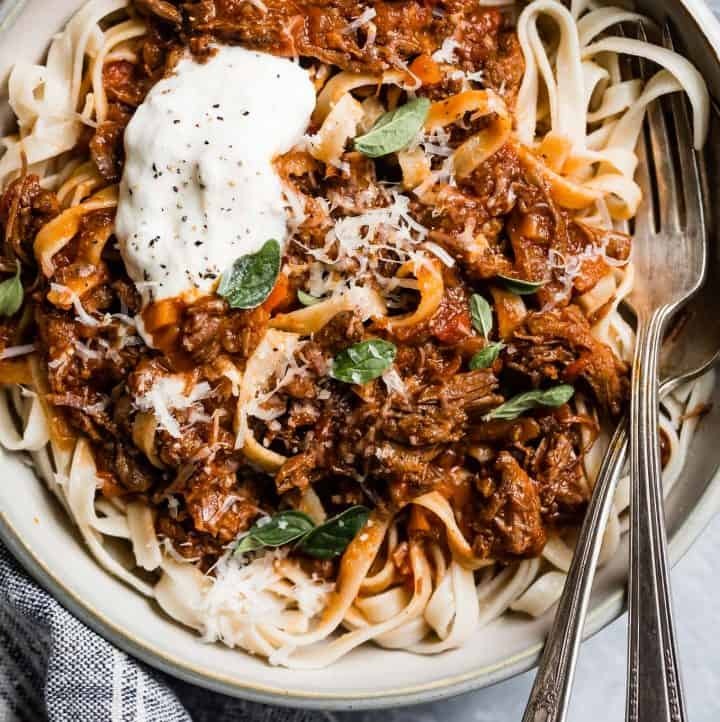 Could I use same amount greek yogurt or more sour cream and achieve same results? Thanks! Great question – thanks for that idea Barbara! I’ve been away from my computer so I’m sorry for the delay! I’ve never tried to used an alternative, but I would think greek yogurt would be a great substitute as it still has some of the tartness that you get from cottage cheese. I’ll also mention you don’t actually see/feel the texture or taste of the cottage cheese in this recipe because it’s spread evenly throughout. It just adds a hint of tartness and moisture while being a bit healthier than sour cream. As Barbara said, ricotta would also be a great idea – especially since it’s used in so many baked italian dishes. Let me know if you try a substitute and how it turns out! I hope you enjoy! Do you have to squeeze moisture from the squash?? This recipes looks fabulous!! This looks AMAZING! 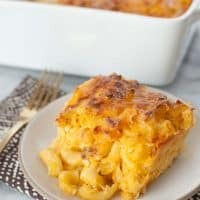 My four year old loves mac and cheese, so I am always looking for healthier versions of it. It looks great but how many calories? Will the Veggies all melt down during baking? Or can you see them in the finished product? Debating if I should puree the Veggies, so they can’t be seen by my kids. Looking forward to trying this recipe! They don’t melt, but they get so soft that you can’t tell that they are there in the final product! The cauliflower looks a lot like the cottage cheese and if you use yellow squash, it looks just like cheese! To be honest, I’ve never frozen it before! I think if you par baked it (like baked it only 50% of the way) and then froze it, it would work if you defrosted it in the oven to bake it the rest of the way! Love these recipes. They make too much for one meal. I would enjoy them, but freezing in single servings in ziplock bags would be awesome. Cook one time, meals for several more days. I would love having a freezer full of healthy single meals to heat in my toaster oven.